I sperged about this on Twitter earlier today but figured I should probably throw it up on the blog too after all. 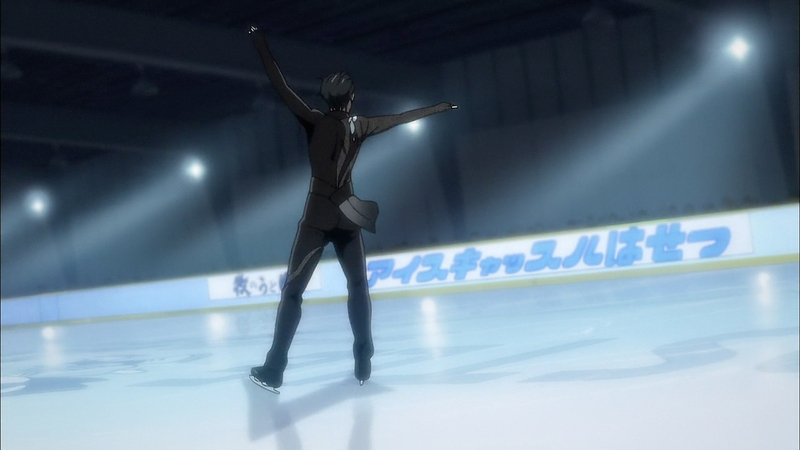 For some quick background: one of the many realistic details the staff behind Yuri!!! 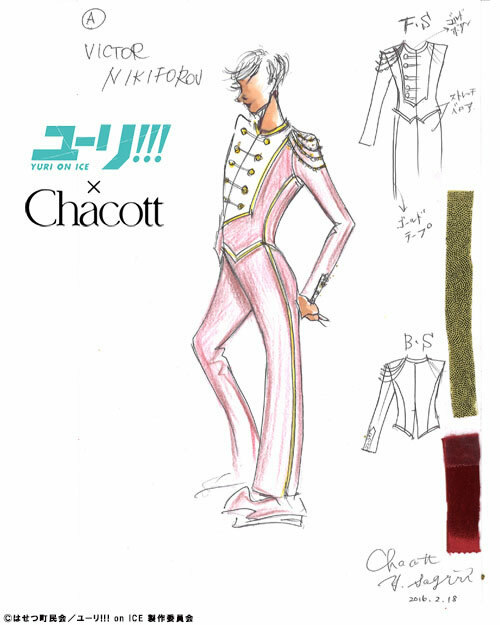 On Ice went for was commissioning designs for the skaters’ performance costumes from a professional ice skating costume designer, Chacott’s Yuiko Sagiri (apologies if the first name reading is wrong). 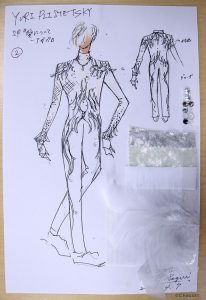 As a cross-promotional type thing, the company the designer belongs to has been posting interviews about the design process each week to talk about the costumes that appear in the episodes. The designs were developed as if they were going to be produced for real, so they feature a lot of nifty details about cut and fabric choice. Of course, the designs have to be adapted for animation, so there are some notable differences between the original concepts and the final products you see on screen. I’ve been translating the interviews for the Sakugabooru blog, you can find the first three here: episode 1, episode 2, episode 3. 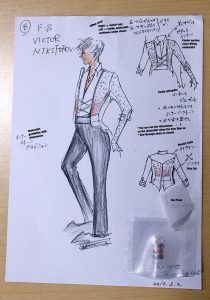 The original concept for Victor’s ep 1 free program costume. 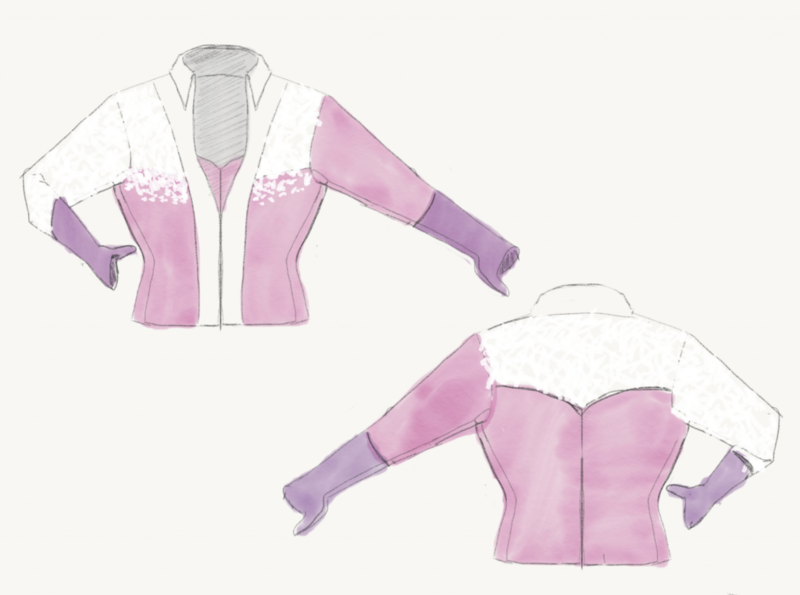 There are a lot of subtle differences between the concept and the final design for this one. 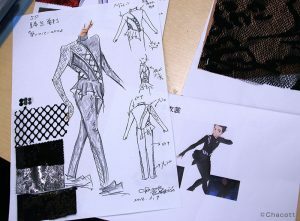 On the front we can see some details were added to the jacket: instead of lacing it now features cords like you might find on a marching band costume, epaulettes and shoulder cords (interestingly these details feature in one of Victor’s teaser illustration costumes) in addition to a set of sparkly lapel-like panels down the front. We also have two different colored sleeves in the anime version and a completely different treatment of the rhinestone application. Note how there are no sparkles on the burgundy sections. 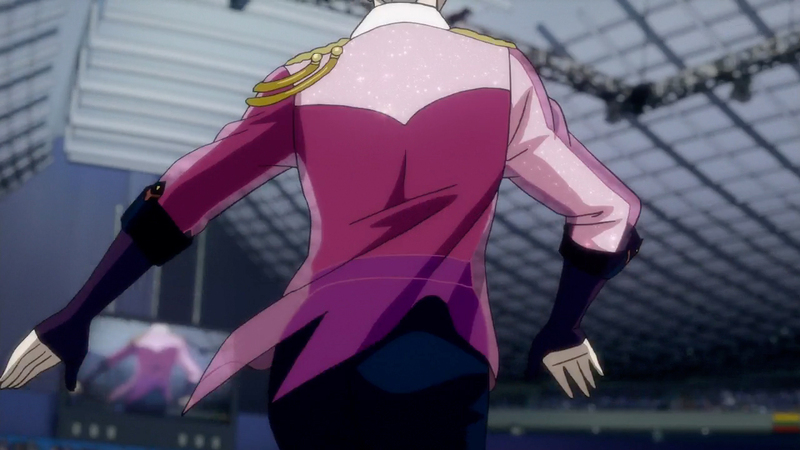 In the anime version it looks a whole lot like either there are sort of princess-seam like panels of the burgundy with the white rhinestones overlapping the seams to create the gradient effect, or the base of the entire undershirt is burgundy and the white sections are entirely created through the application of rhinestones (the former sounds more plausible if we’re assuming this was a real garment). On the back we have one pretty substantial change which almost reads like a misinterpretation of the concept design to me. The yolk on the back (the white panel) in the concept design is noted to be part of the jacket (at least as best as I can tell, and it does make sense that way), not the undershirt. 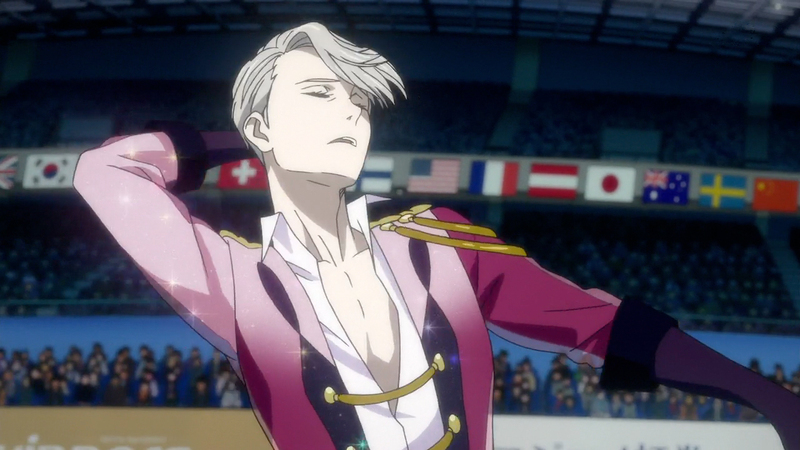 It’s also covered in rhinestones in the anime version. 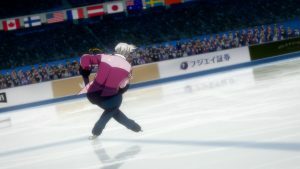 In the concept design it’s described as a separate panel on the jacket, cut out of a stretch satin, rather than the not terribly stretchy georgette that makes up the rest of the jacket––this makes a lot of sense in terms of ensuring the skater would have adequate range of motion across the back to move his arms. The box pleat in the vent on the back of the jacket is actually rendered in some frames! 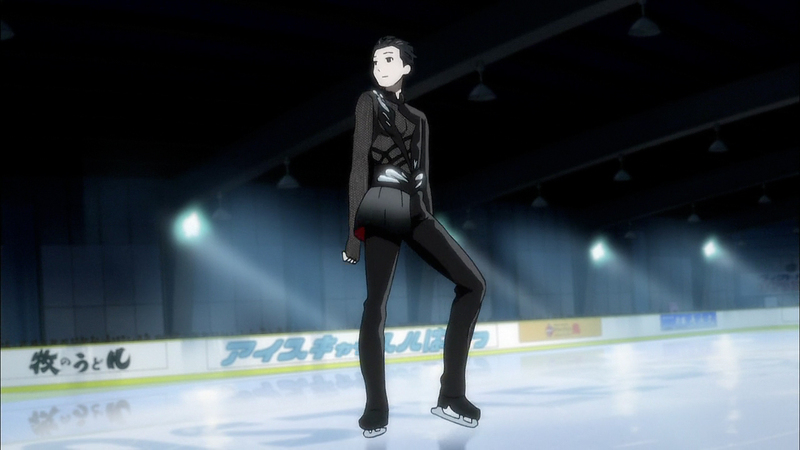 Anyway, the anime swapped it and made it part of the undershirt and covered it with rhinestones (I’m guessing to give a nice big field of the sparkle effect on the back). It’s anime so the practical concern isn’t really all that important, but it’s a bit of an odd divergence from the concept considering the amount of realistic detail put into the rest of the garment: for example they do keep little details like the box pleat in the vent in (albeit only in some frames). It’s sloppy and the proportions are off, but you get the basic idea, I hope. The original concept design for Yuri’s In Regards to Love – Eros costume (ep3). I think the most striking difference with this costume is how much more intricate (and probably awful to animate) the anime design is! The most obvious changes are probably the addition of the wide belt and the big gemstone-like adornments. But what’s probably more interesting (and adds a lot to the complexity of the design) the lacing detail connecting the panels was removed and replaced with more asymmetrical curved panels and the main panels on the front have much more intricate, compound curves in the anime version as well. The back is pretty true to the original design, but there is one significant departure in the pants: the mesh detail is now only present on the left leg and it goes all the way up the back. Another nifty detail added to the anime design is that the “skirt” is lined with a deep red. Personally, I find Hiramatsu’s changes a bit more aesthetically pleasing than the original concept (especially pulling the asymmetry down into the pants), but I would love to know what his thought process was with some of these choices because all those unusual curves on his torso––which is twisting and turning every which way during the performance––don’t seem very animation friendly! 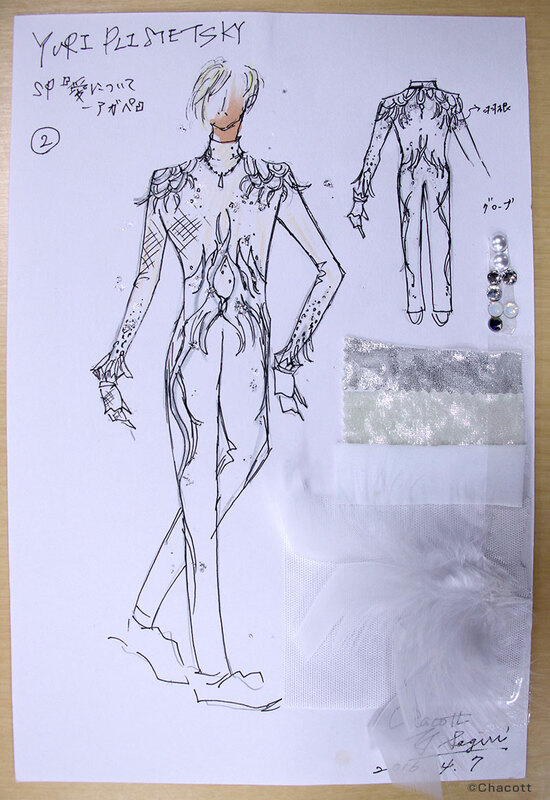 Concept design for Yuri(o)’s In Regards to Love – Agape costume from ep 3. And last (for now) we have Yurio’s Agape costume. The anime rendition of this one is actually pretty faithful to the original design. Most of the changes seem to be primarily about making sure it’s readable on screen––the white mesh is rendered in black, the more subtle rhinestones are replaced with sparkly rainbow ones and there are additional dark grey details. 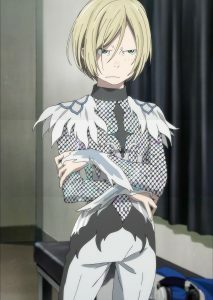 Yuri(o)’s In Regards to Love – Agape costume from episode 3, anime version. The original concept is all shades of white and bright silver, which probably would not have been particularly comprehensible in an anime context (but would probably look really great IRL). Anywho, that’s about all I’ve got on this subject for now. 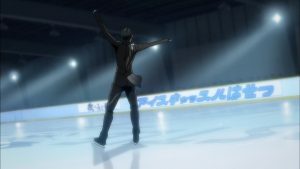 You can find a translation of the ep 3 costume interview (with some more details on the design process behind the ep 3 costumes) on the Sakugabooru blog right now.